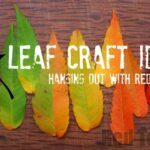 We first made these Leaf Lanterns about three years ago at German Toddler Group – one of the other carers with tons of group crafting experience showed us how to make them – making this a great Autumn Craft for Preschoolers as well as Autumn Craft for kids!!! 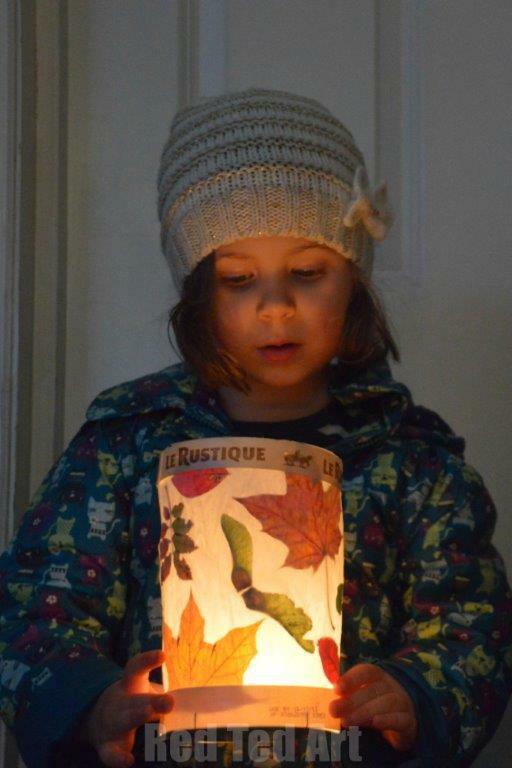 When we first made this leaf lantern, I totally fell in love it! Especially as they were SO easy to make and even the little ones could enjoy joining in. Finally, 3 years later, we had another go. 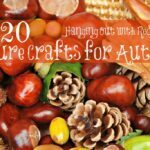 Of course, mine are a little neater, crafting with two kids is much easier than crafting with 10, but the principle applies and lends itself to a group environment! We make these for St Martin’s Day and I first shared our St Martin’s Day lanterns a few years ago. We try and make a new one each year as I try and instill the love for this tradition in my kids whilst living in the UK! 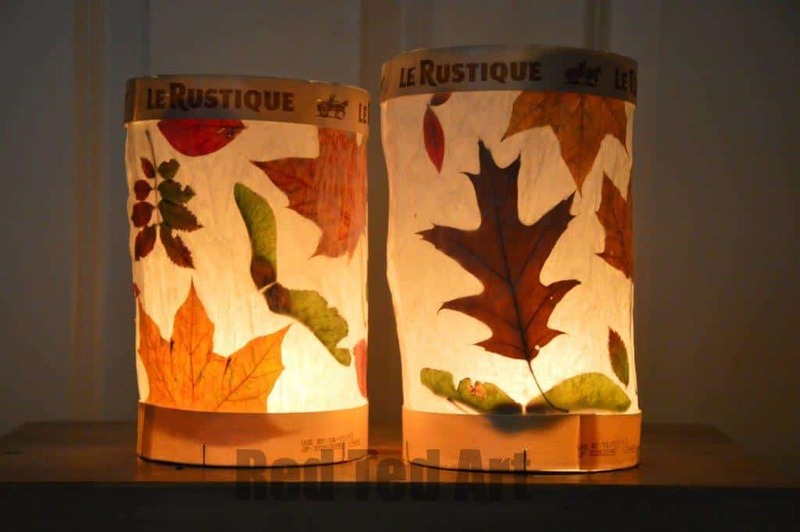 Clearly, you can still make these lovely Leaf Lanterns WITHOUT celebrating St Martin’s Day! Just leave them on the mantle piece of take them out for your own special lantern walk! PS The BEST thing about this craft, is you do NOT HAVE to press your leaves to do this. 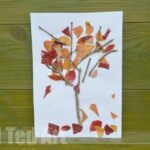 You can make them on the day you collect your leaves, so long as they are not wet! 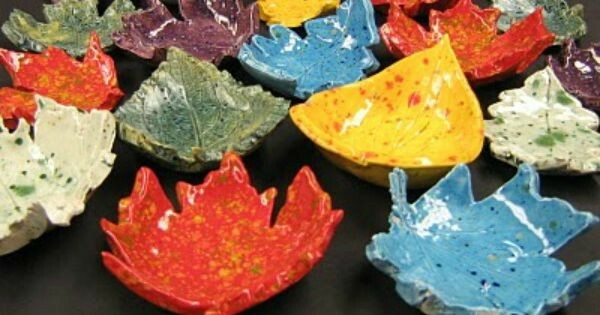 LEAF BOWLS – simply beautiful! Top tip: smaller leaves are better – as you can fit more on! 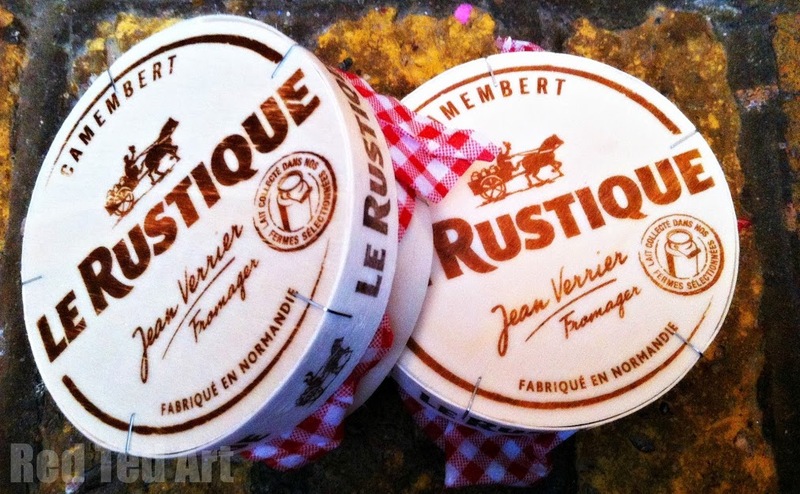 We bought some lovely camembert for the boxes! But cheese like Dairy Lea, also come in good boxes. 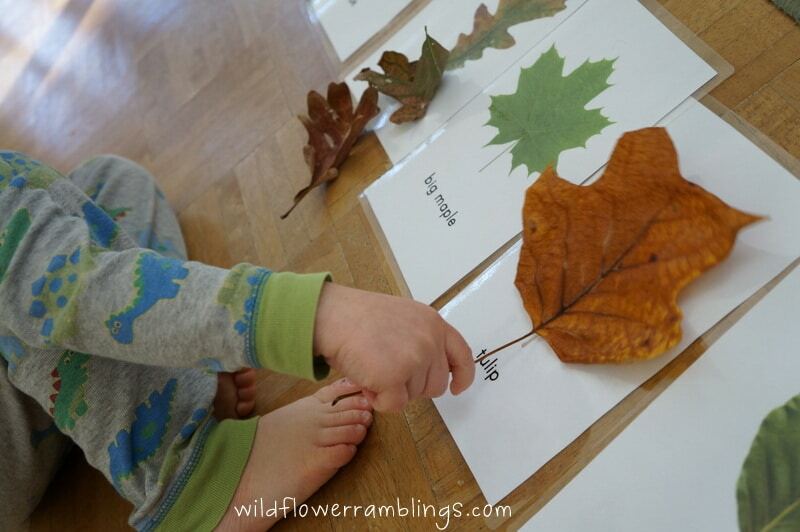 1) We happened to collect our leaves on a wet day. So I pressed them between sheets of newspaper for a couple of days. This has two effects – the newspaper absorbs the damness and also flattens the leaf a bit, which gives you a nice finish. Note: if you leave the leaves damp and went in the paper longer than 2-3 days they MAY start going mouldy. 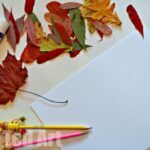 All we aimed for, was for the paper to absorb the dampness and also to flatten the leaves a little. Not to fully dry and preserve them! 2) Cut two sheets of grease proof paper to fit around your cheese base and at a height that you want. 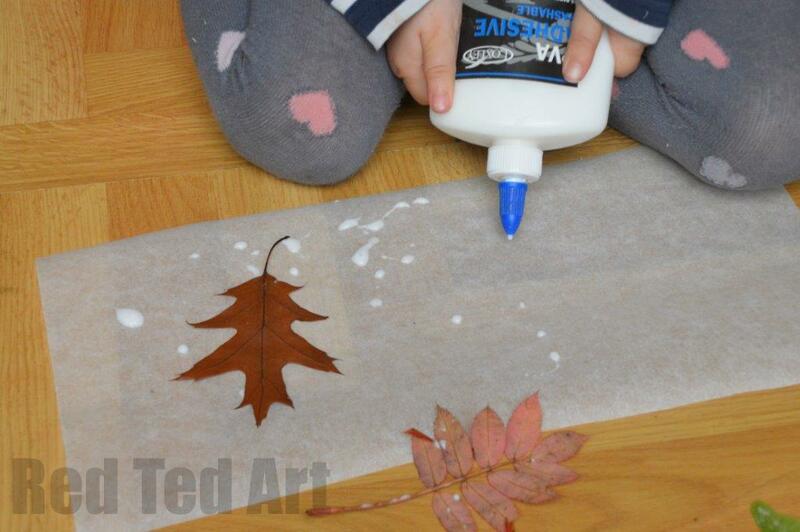 Lay one sheet flat on the floor and add glue. 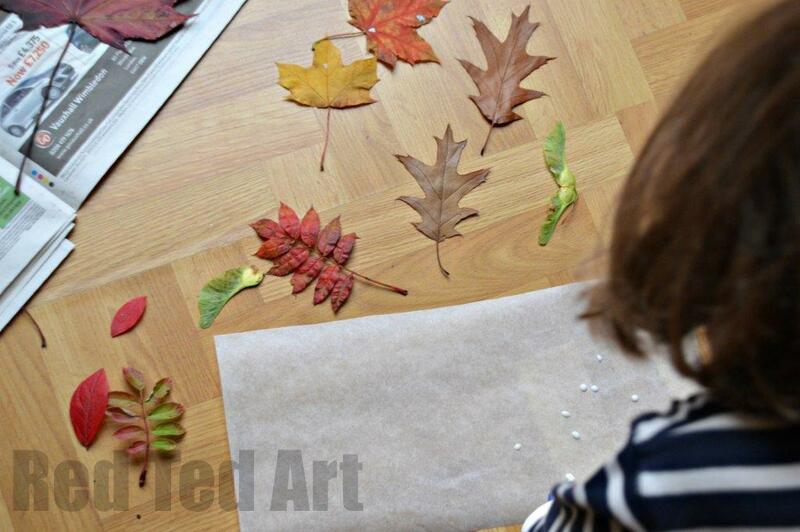 3) Add your leaves – let the kids do as they wish, more is more I am sure! But I also find you will get a better glow if they don’t overlap too much. 4) Add more glue and then press the second sheet of grease proof paper ontop. At home we placed some books on this for an hour or so to give a nice smooth flat finish. At playgroup we went straight to the next step. 5) Take your cheese boxes. I removed the “top part” of the lid, so you have access for the candle. At playgroup we now stapled in the the lantern. At home glued it in for a neat finish. Then repeat for the bottom (admittedly the bottom is a bit fiddlier as harder to get there.. but it worked ok). 6) Add wires or string so you can hang you lantern off a stick. 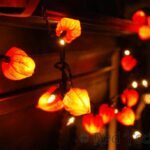 Add lights to your Leaf Lantern and ENJOY the magic! If you are after some more GORGEOUS Luminaries. do check out these wonderful Winter Luminaries – stunning! 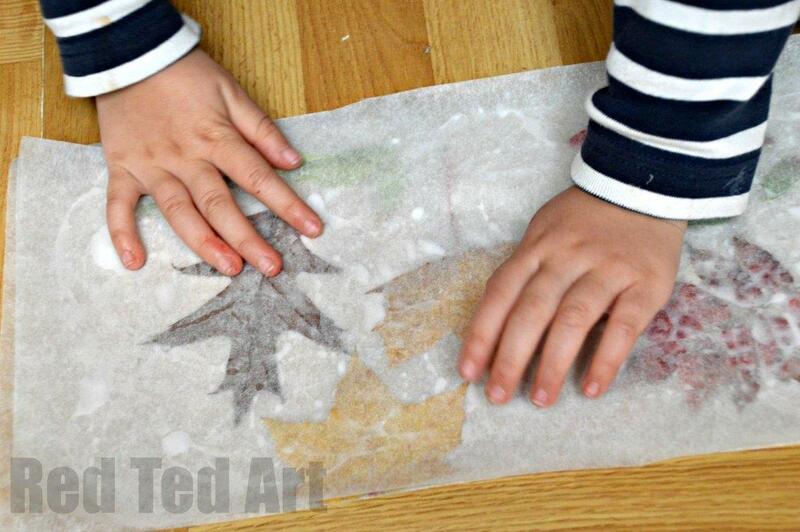 We did a pressed fall leaf craft too! Love how your lanterns look with the light shining through them. Pressed leaf crafts are just so lovely!! Oh I love these! 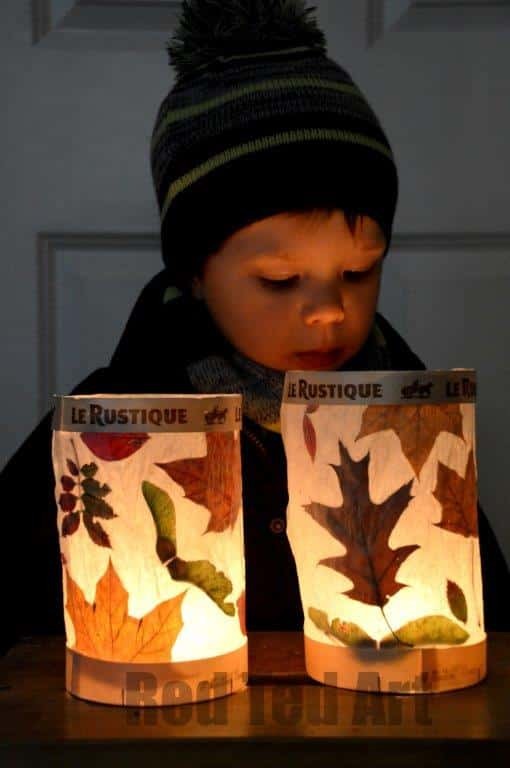 We do leaf lanterns with jam jars every year but we’ll definitely have a go at these instead now! Your daughter”s face is an absolute picture! She was in “awe”! For the photo we used ***REAL*** candles. Which was quite magic…… have fun making! Are there other leaves you could experiment with Johanna? Doesn’t it? Lanterns are definitely “happy things”! These are just beautiful Maggy. Magical in fact. Makes me wish it was Autumn here in Australia. Awwwww… just remember to do them in Autumn!! My pleasure, they are super handy!! Oh they’re gorgeous Maggy! 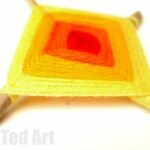 As ever as source of crafty inspiration. Thank you Aly! And I value your years of ongoing support!!! Those lanterns are so beautiful! These are adorable – and children’s names could be painted or patina-ed on too for a personalized edge. Is grease proof paper the same as wax paper or parchment paper? What a neat project! And I know my kids would love to “have” to buy some fancy cheese! LOL! This are beautiful!! 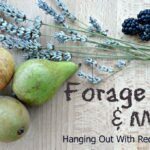 I would love it if you would share at Sharing Saturday this week!! I can’t wait to try this!!!! Just curious, where was the German program and what was it called. I would be interested in it for my little family. Thanks for another great project idea! 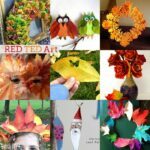 I stumbled across your page today as one is wont to do on the internet when looking for cool craft ideas, and I wanted to say that this is a beautiful craft idea! Fall leaves are just so lovely and they pretty much all go to waste. Go you for saving them in such a beautiful way! Mine usually end up pressed in the dictionary. You could use strips of cardboard and make your own “circles”, if that makes sense? grease proof paf grease proof paper? Do u mean Wax paper? Any paper – like baking paper or yes, wax paper. My name is Gail, Where do I get the canasters for the leaf lanterens.Where do I get the cheese cloth. I am sorry I need some help? Thank you for helping me!!! Do I go to a craft store and buy them or do i go somewhere else. I have never done this before? Thank you again.